North America and Europe Snow Blowers Market size was more than USD 22 billion in 2017 and will witness 4.9% CAGR during the forecast timespan. Increase in product demand across snowy regions has been fueling the North America and Europe snow blowers (snow throwers) market growth from last several years. Around 70% of accidents in winter season happen, due to the inefficient traction on the track. Approximately 70% U.S. population lives in these snowy regions, which receives more than 5 inches of snow on yearly basis and causes about 65% of deaths. This number is more or less the same in Canada and Europe. Governments in these regions are emphasizing on the road safety and increasingly investing on it. These factors are likely to propel the North America and Europe snow blowers demand in near future. Over the past few years, several governments have increased their spending on snow moving and road clearing contracts. Also, municipalities, road organizations and contractors are swiftly adopting the new technologies to track rising snow removing demand. Owing to these factors, snow throwers market is projected to grow with a significant CAGR over the forecast period in these two regions. Across the globe, railway track length is increasing due to the increasing investment of countries and private organizations on railway infrastructure. These regions are known for the heavy snow fall and increase in the railway track length and connectivity in these regions shall propel the product demand in the coming years. For instance, Russia in 2013 invested USD 7,357.8 million to increase rail connectivity and over the next few years, it is projected that it will invest USD 8,658 million according to Russian railway department. Russia is trying to increase its connectivity with the Europe countries and China and these routes go through the high snow fall region such as Serbia. However, snow blowers are not a permanent solution for snow deposition as they only displace snow, which then gets accumulated in other places. More often, the technique of salinization is adopted for melting snow or snow is moved either manually or through shovels. Similarly, the growth of alternate technologies and increasing number of options available for moving snow might be a restraint to the snow blowers market over the forecast timespan. Electric snow blowers shall be witnessing prominent gains in North America and Europe snow blowers market over the forecast timeframe. This can be attributed to its low maintenance and simplified operation and handling. 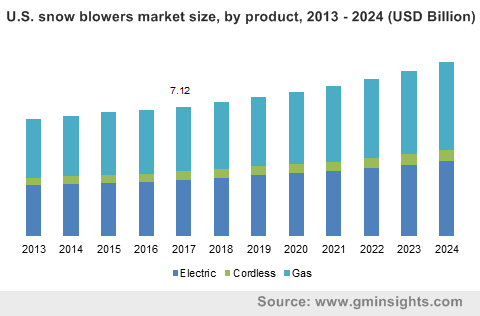 Electric snow blowers accounted for the largest market share in North America and Europe snow throwers market in 2017. Cordless snow blower is expected to create a major chunk of the demand, owing to its mobility and low cost. Gas snow throwers are available in single stage, two stage and three stage. These are used to remove the snow from roadways and railway tracks. Owing to its efficiency and power performance for larger areas, it is projected to experience substantial demand during the forecast duration. Two stage snow blowers held the largest market share in the North America and Europe snow blowers market in 2017 and is expected to grow with highest CAGR over the forecast timeframe. The biggest advantage while using the two-stage snow thrower is that the auger never touches the clearing surface. Operator can adjust the blower’s height by moving metal plates on which blower sits. Owing to this, two-stage snow blower is suitable for almost any surface. The product comes with extra power and added features. Single stage snow blowers are likely to register a significant demand over the forecast timespan in North America and Europe. It is mostly used to remove the snow from gravel, loan, roof and other parts of the house. It costs less compared to two stage snow throwers, which is why it shall be experiencing ascending growth numbers in the coming years. North America and Europe receive record-breaking snowfall every year. From last several years, drastic changes in environment are happening across the globe. Usually when precipitation occurs, and temperature is cold below 32 Fahrenheit, snow fall occurs. Therefore, the more water evaporates into the air, the more precipitation and snow. Increasing global warming is gradually resulting into increased snow fall in the North American and European countries. Some parts of the North America and Europe are experiencing the highest snow fall in the history. For instance, New York has experienced the highest snow fall in its last 130 years history in 2016. In New York’s history of highest 28 snow fall years recorded, 6 are after 2005. This shows how snow fall has increased swiftly in last few years. This drastic increase in snow fall shall propel the snow throwers demand in near future in the region. 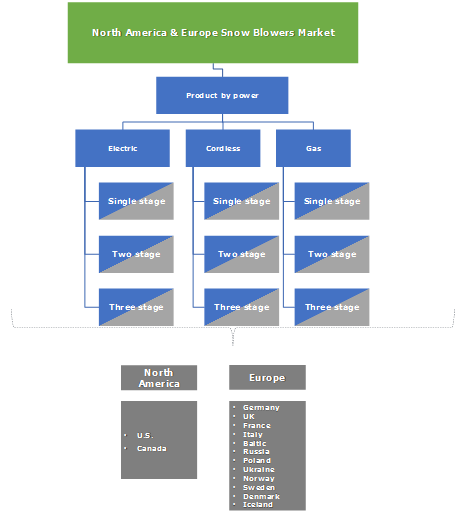 North America and Europe snow blowers market comprises several global players and medium- scale manufacturers including Ariens, Honda, Husqvarna AB, John Deere, The Toro Company, Briggs & Stratton and Caterpillar are some of the established multinational players which have years of experience in the market. These companies are having strong established distribution network and strong brand identity. These market players are spending huge amount of money on the R&D activities, to stay competitive in the market. Entry barriers for the new entrants are high, owing to the strong established multinational market players and advanced technological developments in the market. Multinational players in the market are introducing new advanced products to capture a bigger chunk of market share. For instance, in August 2017, Honda introduced new HSS Series snow blowers. The HSS Series includes the new HSS724A, HSS928A and HSS1332A two-stage models. The blowers are being manufactured at the Honda Power Equipment Mfg. plant in Swepsonville, North Carolina. A snow blower is an equipment which uses a spinning auger to push snow into a discharge chute to throw it to the side or out of the way. Snow throwers are mostly used to clear snow from sidewalks, paths and driveways. Single stage snow blowers have one auger whereas two-stage snow blowers have the main auger, and then an additional rotating auger in the discharge chute to move snow through faster and to throw it farther. Three stage snow blowers used to clear the heavy snow on the paths and railway tracks.